This faked pan movement creates the false impression of a live cameraman operating the equipment, ever striving for that perfect shot. The trick also makes it much more difficult to 'fix' the frames on a static point of reference for scrutiny. Yes, RF... Good eyes (and logic). 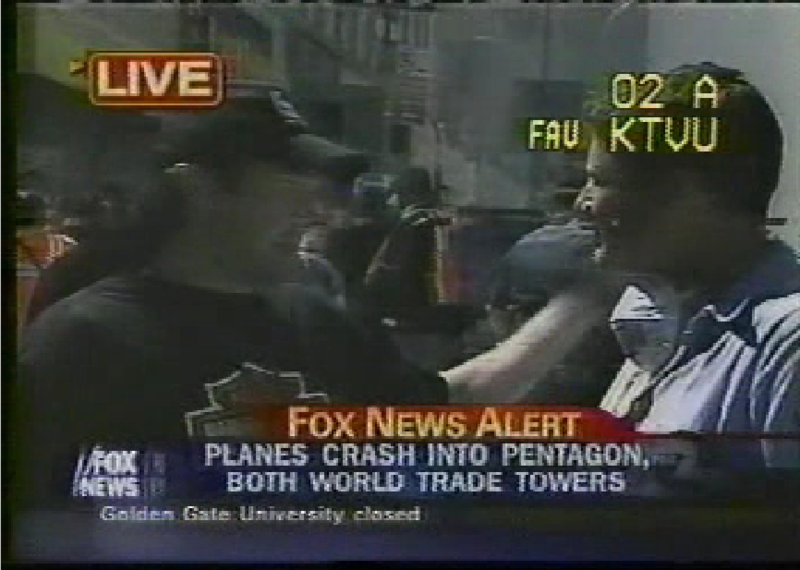 I had missed that (on this Obama video) but I've seen it in many a suspect fake interview/or speech video before. Why move the camera? What are tripods for? That sideways pan movement is, in my educated opinion, a tell-tale/trademark sign of fakery. No professional cameramen will ever keep adjusting/or sideways-panning such a static shot - while a speech/or interview proceeds. Good Heavens!...More chocolate fingers - as seen in the Breivik courtroom??? I think we're onto something, folks ! 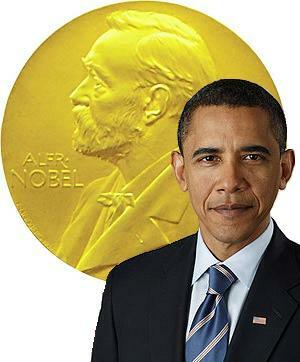 And they gave this "thing" the Nobel Peace Prize, in 2009. Has Norway gone mad? Simon, I daresay your countrymen showed far better judgement when they made Jan Garbarek a Knight, 1st Class in the Order of St. Olav. Last edited by whatsgoingon on Fri May 24, 2013 9:33 am, edited 1 time in total. 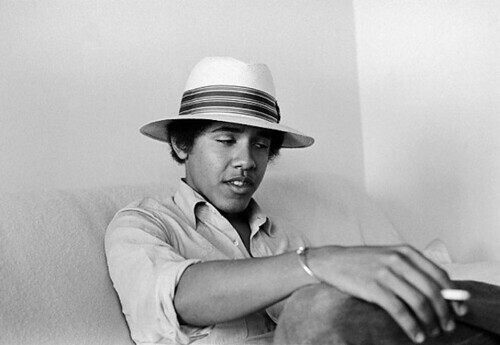 In a new article we learn that Barry Obama was a pot head, http://www.buzzfeed.com/gavon/a-users-guide-to-smoking-pot-with-barack-obama. These are supposedly pictures of Obama in high school at Punahou School in Honolulu and Occidental College in Los Angeles. Its actually incredible this is not getting more attention. Remember the scrutiny when we learned Bill Clinton smoked dope but purportedly never inhaled. Its even more mesmerizing because Obama's administration through the DEA and FBI is on the witch hunt closing down medical marijuana stores in California and other states. In the US its a federal law violation to be caught with marijuana. A number of states have voted to make it legal for medicinal purposes by prescription. Regardless the feds are raiding them and closing them down. 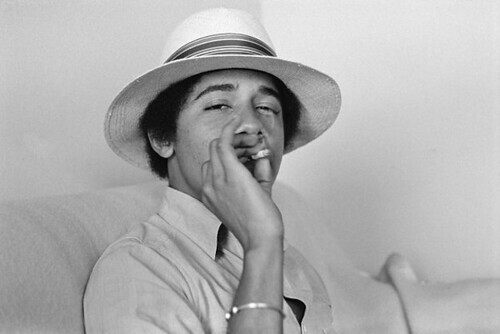 More from ABC, http://abcnews.go.com/blogs/politics/2012/05/obama-and-his-pot-smoking-choom-gang. 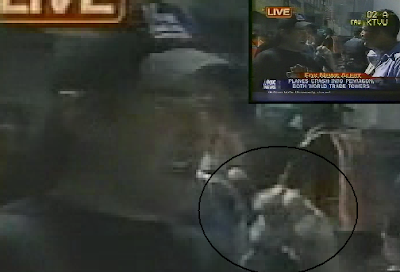 I'm not impressed with the low quality images but the story that is Obama continues to unfold. I tend to think mr o is not a real person. If that's the case then the pics above are all fake. I'd like to hear what the experts here think. I'm no expert but agree that the photos look very faked. The photo below sticks out in particular. 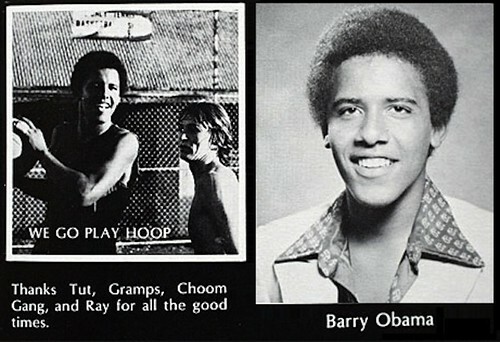 "Obama" was apparently born in 1961, so this would have to date, in theory, to the 1970s, long before digital cameras. If genuine, it could only be a digital scan from a print/negative/slide. From a brief online study of the colour shift phenomenon, the orange hue is apparently due to the dye colour layers in the paper being affected differently by light, heat and moisture. I'm sure the whole image is fake, and the orange colour shift is fake, too. It's simply the result of a PhotoShop process. Applied by the fraudsters to falsely present the image as coming from an aged photo print, to enhance its credibility. 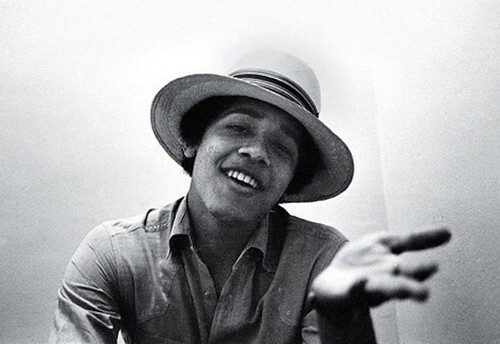 The ageless "Obama" will reportedly be 51 in a couple of months. Amazing! Using the histogram function from the ImageMagick library..
Last edited by reichstag fireman on Sun May 27, 2012 1:53 am, edited 9 times in total. AmongTheThugs wrote: I tend to think mr o is not a real person. If that's the case then the pics above are all fake. I'd like to hear what the experts here think. FWIW, I was on a production crew at an event in Florida during the campaign before the election and watched "Obama" address a crowd with a handheld microphone that we provided. He looked quite a bit like the television images and photos we see of him today. Who this person actually is I could not say, but I did witness him live, walking and talking, from a distance of 30 feet or so. And also one other time at a fundraiser for a small group, once again at a distance of 30 feet or less. I feel confident he was not animatronic, but I cannot say whether or not he is an actor or CIA plant or some other such stage persona. - Direction of head shadow of man on right does not match shadows of men on left and center. - Left hand of center man (where it overlaps man #3) is deformed and unnatural looking (amputated 6th finger?). - Direction of head shadows of the 2 foreground men do not match the shadows of chairs in background. - why is aspect ratio of this image different than the first image? Cropped? If so, why? - Man on left in both photos doesn't really look much like B.O. to me (my opinion). - Face of man on left has been manipulated to some degree. 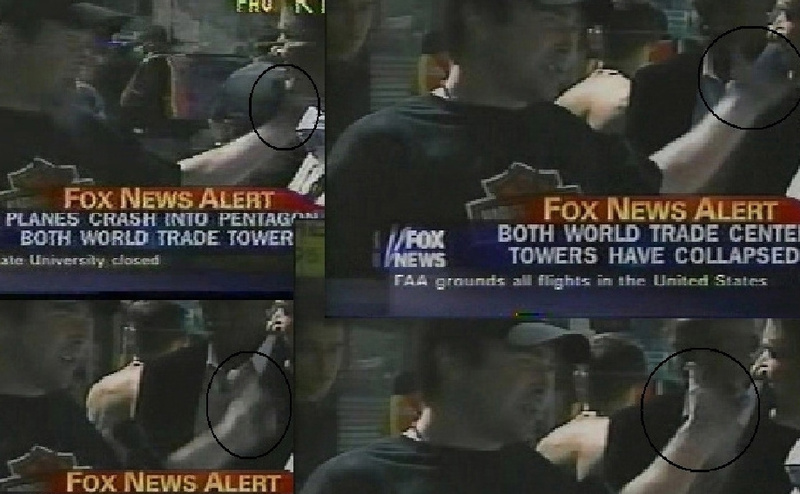 - Appears to be a composite image: man on left not being from same source as other 2 men. 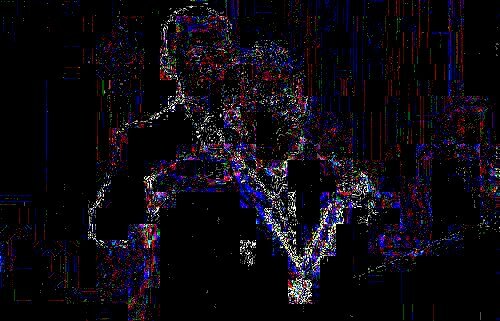 - man on left not from same source as rest of image. Last edited by lux on Sun May 27, 2012 2:39 am, edited 1 time in total. This picture is very obviously odd, in so many ways. My initial impression is that which everyone semi-consciously registers- an almost fish-eye lens upsweep of heads. But there's an apparent difference between the Obama-totem on the viewed right, and the individuals depicted upon the viewed upper left. Person A seems to have almost no lower body (see 'legs1'), but isn't as much of a legless torso as Person D....the intercept point 'legs2' appears totally-inconsistent with the stair-step shared by PersonB. Person D is just an upper body, staring to her right in a completely-isolated fashion...and what is that object on her left cheek? Person E is a very curious creature. 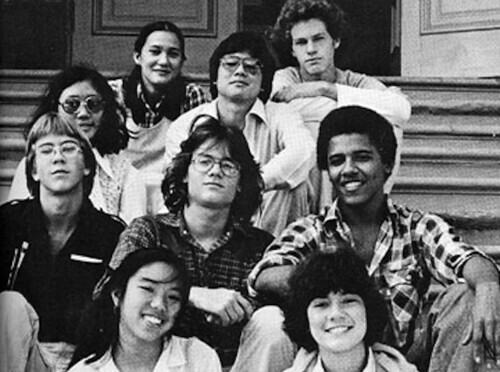 Their upper body slants in synchronicity with the rest of the totem pole, but the head is bent away from the group, and backward, in a manner that maybe balances attention away from the main subject of the picture, Young Obama. But look at Person E's left knee....depicted by the carat ^. Where is it? Does it blend into the entire leg of Person F? 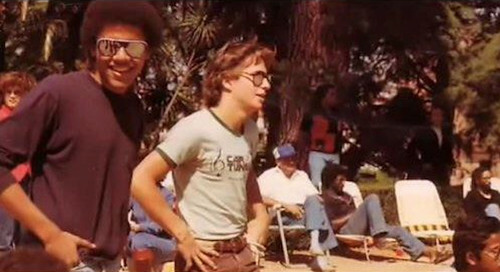 Similarly for Person F- his left leg merges entirely into Young Obama's absent right leg. Where does Obama's leg go?? 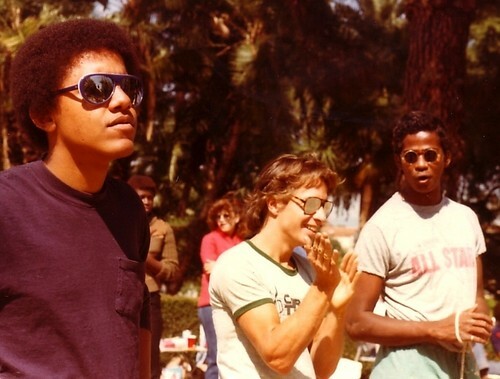 And Young Obama's left leg, jeans-clad, seems added, and too lit from above, as it descends into the hidden intercept depicted by the equals sign =, where his waist anatomically should be. Yet this seems far too low-down, compared to the waistline of Person E (shown at ...), yet they are meant to be sharing the same step. Final points (for now)...back up to the top, and Person C, also (perhaps?) hunkered-up on the top step. Look at his left hand, atop what's meant to be his right arm, 'behind' the shoulder of Person B. The fingers don't appear natural at all. 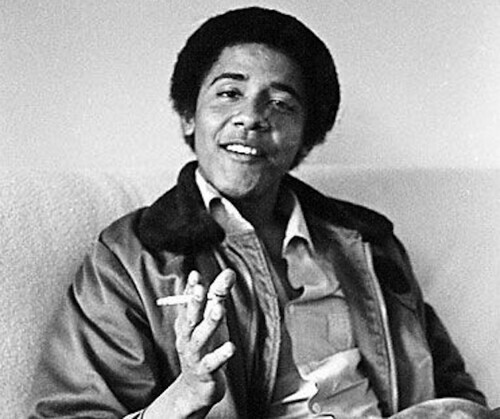 And Obama...he happens to be holding a pen/roach/spliff/dark cigarette, in the extreme bottom-right of the picture. Credible? ^ Yes, it does look like a collection of cutouts. You dont need a weatherman to know what way the wind blows.